Wolf Moon - Lleuad Blaidd - The hungry wolf calls to the moon - for change will come. 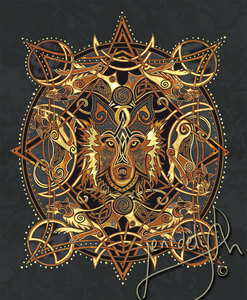 Faoilleach - the old Gaelic/Irish winter month means the Month of the Wolf. The cold January Wolf Moon lightens the path of the hunters, showing the way. across the heavens - creating day and night until the end of the world - Ragnarok.